Former Boston drummer John Thomas "Sib" Hashian died March 22 at the age 67 after collapsing on stage during a performance on the Legends Of Rock Cruise in the Caribbean. TMZ reports Hashian’s son, Adam, confirmed the drummer suddenly collapsed midset while playing with former Boston lead guitarist Barry Goudreau, while a witness tells the media outlet that attempts to revive him with CPR and a defibrillator failed. The Legends Of Rock Cuise – featuring original Foreigner vocalist Lou Gramm, John Cafferty, The Grass Roots and former members of the Beach Boys and Kansas, among others – departed from Miami, FL on March 18 with planned stops including Puerto Rico and the Bahamas. TMZ has been told the cruise will continue and other musicians will be performing tributes to the drummer. 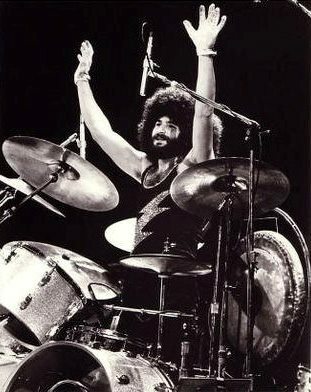 Hashian joined Boston following the departure of original drummer Jim Masdea at the request of Epic Records. The rocker first performed with founder Tom Scholz, singer Brad Delp, bassist Fran Sheehan and Goudreau as part of a live performance audition for the label before a record deal was signed in 1975. Hashian appeared on Boston’s 1976 self-titled debut and its follow-up, 1978’s “Don’t Look Back”; combined, the two projects have sold more than 24 million copies in the US alone. The drummer left Boston during the recording of the band’s third release, 1986’s “Third Stage”, only to be replaced by a returning Masdea. Hashian later sued Scholz for back royalties and the pair settled the matter out of court. The drummer owned a record shop and a chain of tanning salons in Boston; he occasionally performed with Goudreau, Sheehan and Delp over the years, and dabbled as an actor in local theater. Hashian has a son and two daughters – one of which, Lauren, gave birth to a daughter with boyfriend Dwayne “The Rock” Johnson in 2015. Boston recently announced the addition of 21 concert dates to their upcoming summer tour of North America.